The stress of running multiple retail or restaurant locations can get you hot under the collar. Having easy access to reliable HVAC commercial contractors makes keeping those stores comfortable a breeze. Nothing makes prospective customers turn around and head back out to their cars faster than realizing your HVAC system is on the fritz. Too hot? Too cold? They’ll take their business elsewhere faster than your store manager can apologize for the uncomfortable climate inside. Commercial HVAC systems need regular maintenance and prompt repairs. It can feel like you’re always on the phone trying to track down a contractor to service your system. It’s challenging enough to keep a single location’s temperature and humidity comfortable. Once you have dozens or even hundreds of locations, maintaining a comfortable, safe inside environment for your customers and employees can be an unmanageable task. One location? Piece of cake. But maintaining multiple commercial HVAC units in locations strewn across the state, region, or country is a different matter entirely. Getting quotes from contractors, vetting their qualifications, and then checking their work – if they even show up to do the repairs – is time-consuming. In many states, commercial HVAC contractors must be licensed. Licensure ensures the HVAC technicians know what they’re doing and can provide a beneficial service to customers in a safe manner. At RCS, we only choose the best of the best contractors to serve our clients. We verify licenses and make sure each contractor has the highest level of training for the job before we send them to your location. Mistakes and accidents happen. If they occur during an HVAC job, the commercial HVAC contractor may be liable. If this happens, a contractor who doesn’t have insurance may not have the financial ability to compensate the injured business. RCS will ensure the contractors we send to your retail location or restaurant have the necessary liability insurance before starting any work. Typically, the experts recommend a business should get at least two estimates from two different commercial HVAC companies before hiring a contractor for the job. Logically, choosing the company with the lowest estimate makes sense, but it’s important to understand why the estimates are different. 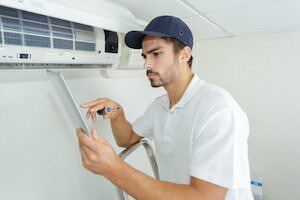 It’s one thing if an HVAC company charges a slightly lower hourly wage for its labor; it’s another if they leave out important elements of a project or use lesser-quality equipment or materials. As an RCS client, you won’t have to spend your valuable time trying to find the right HVAC commercial contractors to fit your budget. We handle that for you. We know what to look for and will narrow down the estimates to ensure you have exactly what you need. At Retail Contracting Services, we make it our priority to ensure you have the best HVAC commercial contractors handling all of your business climate control needs. One call to us means we will take care of all the details for you, so you can carry-on with other more pressing tasks for your business. Call today to discover the simplicity of working with RCS.